The Kalahari morning was icy as Hal and I crawled out of the leopard *blind. The red African sun had crept through the haze covering the hills on the distant horizon a short while ago, and we had sat tight in the hope that the big cat would make a mistake. The low winter temperatures just before daybreak often surprise first time visitors to Namibia. We had spent several evenings and early mornings in the blind, but our leopard was not to be fooled – being nocturnal by nature he fed in the dark and I assumed that he was using one of the nearby rocky koppies to keep watch on his kill. Like a phantom he arrived and left in total darkness. The frustration of hearing him gnaw on the carcass of the young hartebeest cow which he had dragged into the rocks was frustrating beyond belief. We could hear and smell him – but we could not see him! *Blind – A camouflaged hide, usually crudely constructed out of natural materials, within sight of an area where a free roaming predator is feeding on its prey. 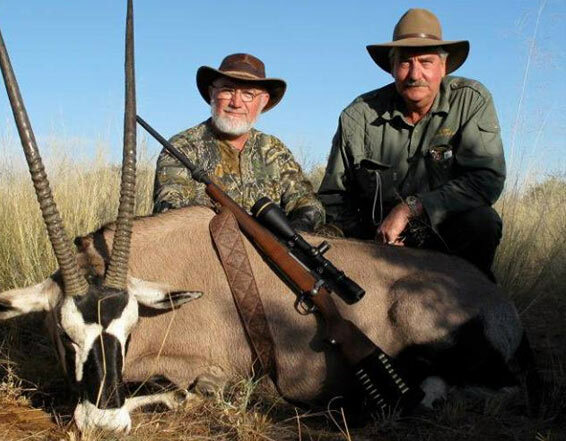 In Namibia hunting with any form of artificial light is illegal and we were therefore dependent on either the fading rays of the late afternoon sun or the first light of morning to spot our prey. I prefer it that way, as I feel very strongly that hunting should remain a sport, and that a hunter who will take his animal by any means, whether ethical on not, is merely a ‘trophy collector’ and not a true sportsman – and therefore not welcome in my camp. The walk back to the Landcruiser hunting vehicle was in silence, as spirits were low. On our way I noticed some tracks over those which we had left earlier that morning. Two adult cheetahs had passed within 200 m of our blind just minutes before. Our fuzzy- eyed disappointment after the leopard’s silent pre-dawn departure was immediately forgotten as our new quarry got our full attention. The cheetah is one of the most difficult animals to hunt as they are travelers and can cover vast distances in one day in search of prey. 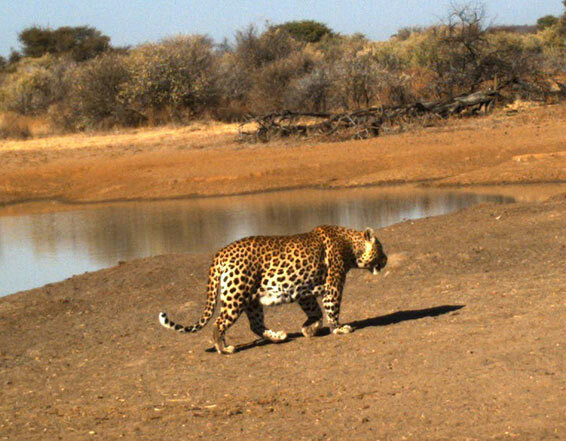 I usually start tracking these elusive cats in the early morning, and hope to progress quickly enough to catch up with them at a fresh kill, or resting in the shade during the heat of the day. Cheetahs prefer to move along game trails or bush roads so tracking them is relatively easy going until they spot their prey or move onto higher ground from which to survey their hunting area. They often make use of a gently sloping tree for this purpose. Hal hails from Texas and, like many Americans, favors the 7 mm Remington Magnum as a plain’s game caliber. Early in my career as a professional hunter I came to realize that this was not my favorite caliber, as almost all big game had to be tracked after placing close to perfect shots. It just seems to be a little too fast and not sufficiently heavy to deliver the required knockdown power. My personal working rifle is a 338 Win Mag in a Mannlicher Schoenauer which kills swiftly and efficiently on demand. Our progress was slow as the cheetahs soon turned off the track and started heading for a small rocky outcrop about 1 000m away. The fact that the area that we were tracking in was very sandy with 1m tall grass did not make things any easier. Cheetahs hunt with their eyes and our advance across the savannah on their tracks could therefore easily have been observed by our spotted friends from their vantage point on the high ground of the koppie. In the ever increasing heat of the morning sun I constantly glassed the terrain ahead of us as well as the high ground and the hills in the distance in the hope of spotting them before they spotted us. Cheetahs are not courageous animals and will always flee at the slightest sign of danger. They sprint very quickly over the first few hundred meters and therefore place the hunter at a disadvantage as they usually spot you first and run off. If following closely on their wake you will only come across running tracks without having noticed their swift departure. This will leave you about 500 m behind your quarry. If, however, you flush them during the heat of the day they will most likely only go for about 200m, and you might get lucky by glassing every shady spot ahead. If more than one cheetah is flushed you can often locate them by their bird-like chirping communication call. The sun had by now climbed to a height that forced us to get rid of most of our early morning clothing. Clearly, it would be another scorcher of a day. Each time the track was lost the disappointment showed on Hal’s face, and the anticipation grew sharply when it was found again. It was like a roller coaster ride with highs and lows every few minutes. I was hoping for a kill by the cheetahs, as various herds of game could be seen ahead of us. Acinonyx Jubatus (what a name! ), or cheetahs, are the ultimate killing machines. They run down their prey at high speed and use their non-retractable claws to bowl it over by knocking its hind legs from under it. Death is brought about by strangulation. In our area they prey primarily on small and medium-sized antelope, hare, guinea fowl and ostrich.They will not eat carrion or anything not freshly killed. Depending on the size of their prey the cheetah will not drag it very far – usually to the nearest shade. Totally exhausted from the hunt, the cat will rest before feeding, and it will eat sparingly. Birds such as guinea fowl will be devoured feathers and all. 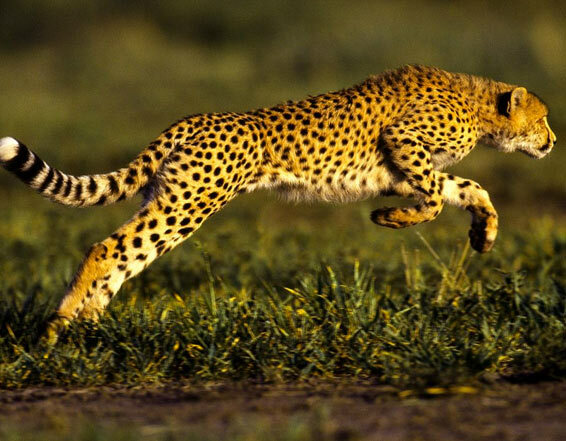 Cheetahs usually abandon their prey after one meal or when there is pressure from other predators. If circumstances allow, it will kill almost daily and is therefore considered vermin by most stock farmers and very often shot on sight. The Cheetah Conservation Fund is doing outstanding work to educate farmers and supports the sustainable and ethical utilization of this magnificent cat for trophy hunting purposes. From the tracks it was quite clear that we were following a large male accompanied by a female, which I assumed was in oestrus. In our area, male cheetahs are usually found on their own, unless with a female who requires mating. On the other hand, when one comes across a group of cheetahs, it is normally a female with her cubs. They use a very peculiar – almost human – system of socializing. A gently sloping tree which is easy to climb is marked and called a ‘play tree’ by locals. Whenever company is sought by either males or females they visit the local ‘play tree’ as humans might frequent the local pub. The ‘play tree’ on our land is visited by a variety of cheetah almost daily and we make a point of checking the area regularly and clearing the surrounding earth of tracks in order to monitor the presence and movement of cheetah. By now it was approaching midday and the heat was becoming intolerable. 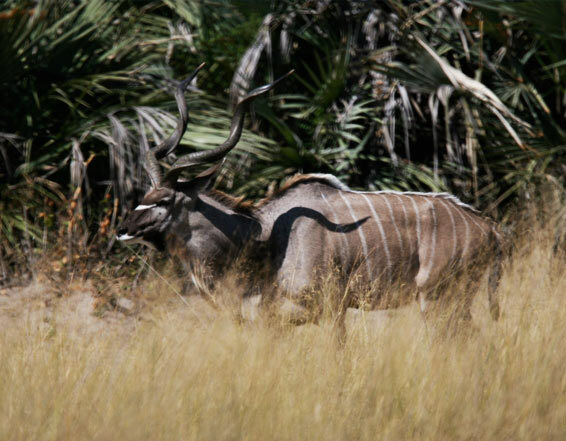 The tiny kudu flies, in their desperate search for moisture, were buzzing around our eyes and mouths – much to Hal’s irritation. Something had to happen soon or we would be forced to abandon the chase. I normally stop tracking by about 11 o’clock because of the fall of the sun on the tracks and the resulting difficulty in identifying the different shapes due to the lack of shadow around the edges of the imprints. It was becoming clear from the tracks at this point that the cheetahs were looking for a shady spot to rest during the heat of the day. 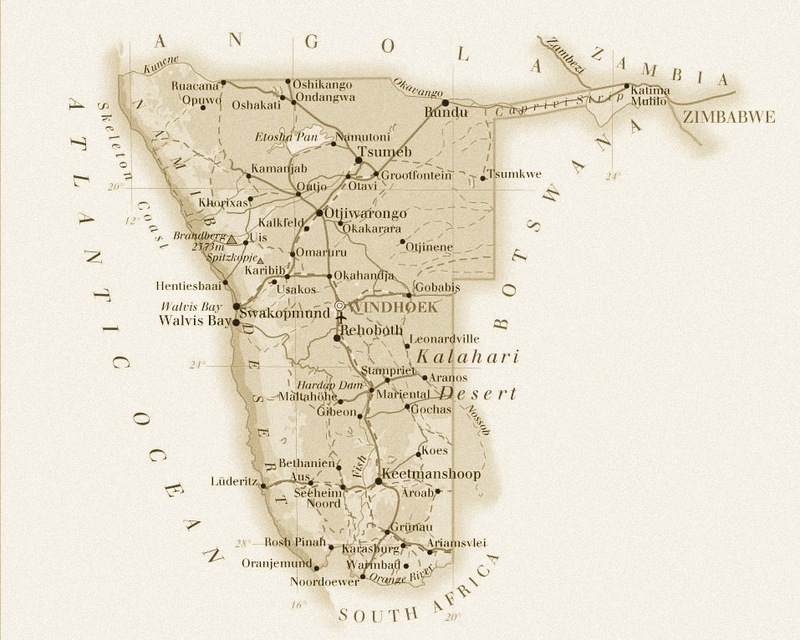 Tracking was becoming almost impossible, as the spoor went in circles and in all directions. I called a halt and decided to survey the general area ahead of us. A slight movement at the base of the rocky koppie about 400 m away caught my attention. We crept forward and as we rounded the edge of the koppie my tracker Johnny – often referred to a “Zeiss Eyes” by our clients because of his amazing eyesight – excitedly whispered cheetah ! Johnny had spotted a huge male lying on a sloping branch of an enormous Camelthorn tree about 100m ahead of us. Hal was ready to take aim in a split second and as the cat was broadside he gave Hal the perfect opportunity. He did not hesitate when I told him to take it. As the 7 mm exploded the cheetah fell over backwards and I knew that he was ours. The 7mm Remington Magnum bullet had struck him in the centre of the shoulder and, even though this is a thin skinned animal with a chest width of only about 25 cm, the bullet never exited from the opposite side. When we later retrieved the perfectly formed mushroom bullet, I was more convinced than ever that this caliber was not for me. However, these wonderful animals had once again offered us an exciting, challenging and satisfying hunt.